Every year, some families choose to have their Chinese New Year reunion dinner at home, while others prefer feasting at a nice restaurant. Prepping food for the extended family can be a chore, but finding a restaurant good enough to suit the preferences of a large group can be a challenge as well. 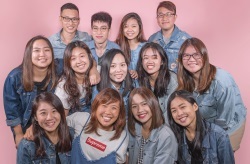 Here are 10 CNY reunion dinner places, in the sequence of the most atas to the more casual and relaxing spots, to make a reservation at if you want to one-up last year’s CNY reunion dinner. 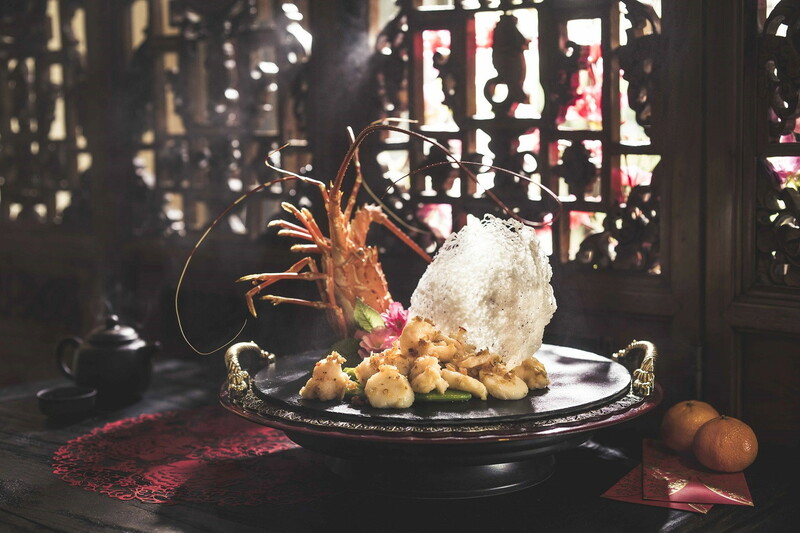 Szechuan Court in Fairmont Singapore offers a Chinese New Year menu that doesn’t disappoint. Must-tries would be their Sautéed Australian Scallops and Maine Lobster in X.O. Chilli Sauce ($68++ per portion) and Fish Roe Prawn Mousse Phyllo Dough Roll ($8.80++ for two pieces). 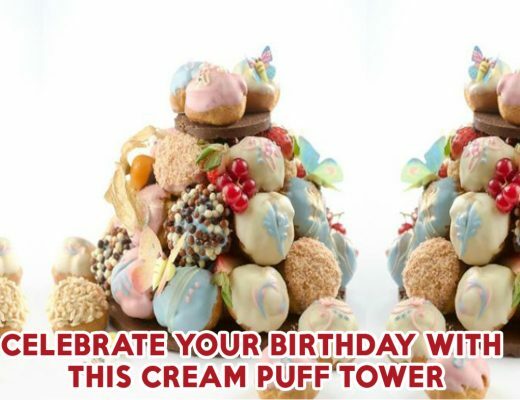 Alternatively, select from seven different set menus, with prices starting from $498++ for four people. If you’re looking for a place for reunion lunch, they offer an extensive menu of dim sum as well. Pine Nuts Barbecued Pork Bun ($8.80++ for three pieces) and Salted Egg Stuffed Prawn Bean Curd Skin Roll ($8.80++ for three pieces) are dishes that will be a hit among both the old and young. 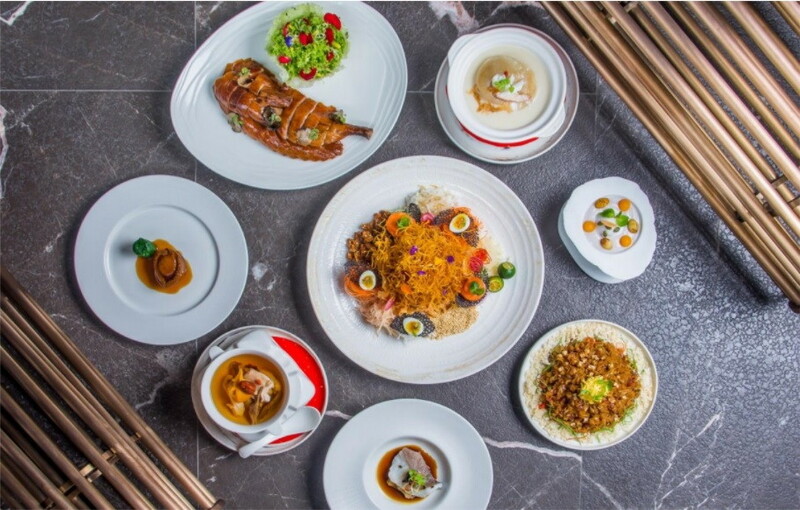 For those looking for hearty Cantonese fare with a cool location to boot, Yàn at the National Gallery offers seven set menus ranging from $118++ to $268++ per person. Dishes to look out for include their Golden Pumpkin Broth with Crab Meat and Bird’s Nest and Suckling Pig Carved Shoulder. If you’re looking to up your game and impress your guests, get their Yan’s Signature ‘Shun De Style’ Lo Hei. 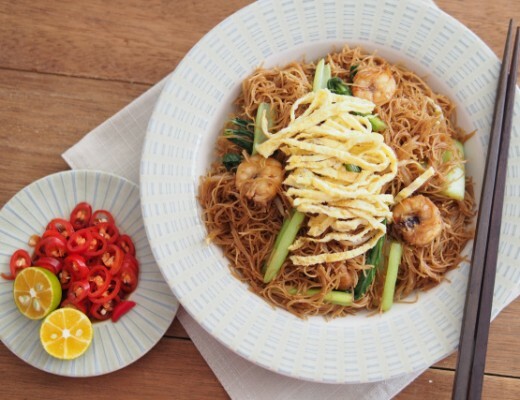 It features slices of salmon and lobster atop a tower of fried vermicelli, and a good scattering of gold leaves, ginger, spring onions, capsicum and peanuts. This is what I call a party in the mouth. Takujo’s Lobster Pen Cai Claypot ($368++ for eight to 10 people) tempts me to ditch the usual Chinese food for a Japanese feast this CNY. Found within Emporium Shokuhin, this Japanese restaurant goes all out by serving their pen cai with a Boston lobster, Hokkaido scallops, kurobuta pork belly and more. Lo hei is a must, so be sure to get their Takujo Signature Sashimi Yusheng ($88++ for four to six people) as well. Each order of this yusheng comes with six slices of chutoro sashimi! VLV Singapore is certain to make your family members go “wow”. 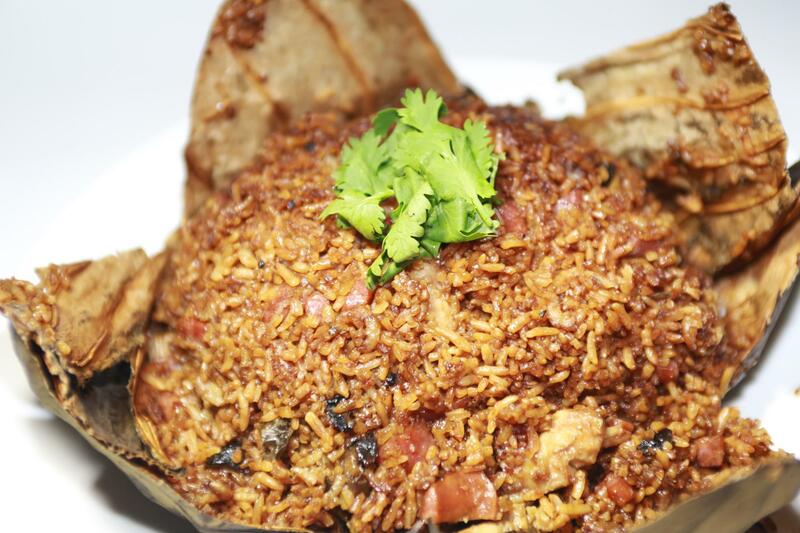 It is a classy Chinese restaurant at Clarke Quay with an immersive ambience to boot. Their entrance reminds us of those popular kung fu dramas on TV. Their Spring Course ($298++ for four, $448++ for six people) boasts eight tasty dishes, such as Braised Dried Oyster With Prawn & Black Moss, Crispy Sakura Chicken with Sesame, and Yuzu Berries Cheesecake. Bond with your folks by taking a stroll down the riverside after dinner! 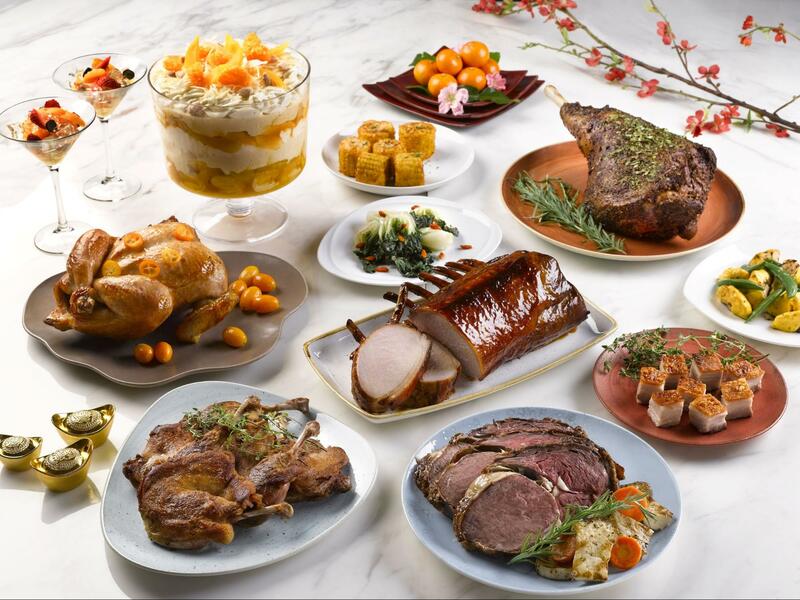 If you have a family of meat lovers, have a feast at The Carvery this CNY. On top of their usual dishes, you can look forward to exclusive festive items including Szechuan Spiced Roast Leg of Lamb, Kumquat Chicken, and Marmite Pork OP Ribs. The marmite pork ribs is an elusive one, and is only available for dinner on Chinese New Year eve until the third day of CNY. On 15 Feb 2018, adults pay $48.80++ for buffet lunch, and $68.80++ for buffet dinner. For days between 16 and 18 Feb, it’s $48.80++ and $64++ for lunch and dinner respectively. 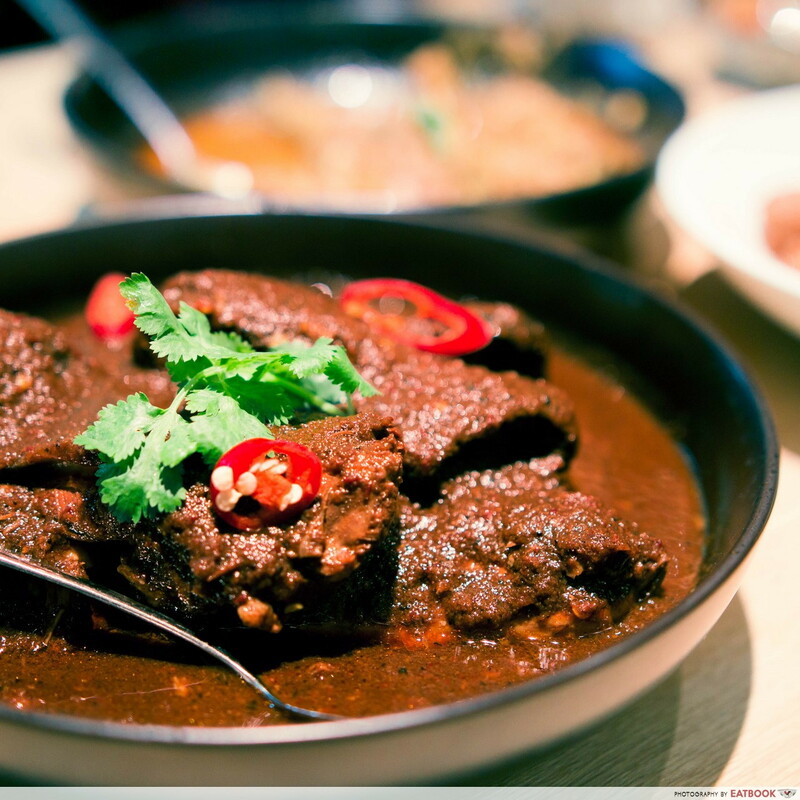 Peranakan or not, it is hard for anyone to not love the homeliness and warmth that Nyonya dishes bring. If your grandparents or even you are die-hard fans of Ayam Buah Keluak and Bakwan Kepiting, you will be glad to know that Folklore will be having a CNY buffet special that serves both. Available from 15 Feb 2018 to 2 Mar 2018, their Tok Panjang Dinner ($68++ per person) offers 15 free-flowing Peranakan dishes. Highlights of the buffet include Sambal Belimbing, Babi Pongteh, Itek Teem, and Peranakan Prawn Salad. It’ll be a mistake to give their Kueh Pie Tee a miss. Stuffed with bamboo shoots, jicama, and pork belly, these pie tee cups are packed with flavour and was one of the most memorable dishes we had while we were there! Save yourself the hassle of prepping, cooking, and cleaning up, but still get that warm satisfaction from a homely meal when you dine at Gu Ma Jia. The food here is inspired by the comforts of home, and taste hearty. 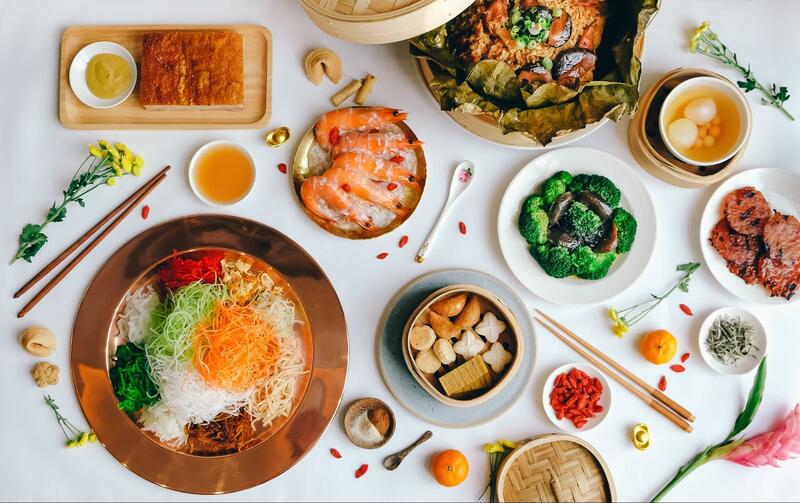 The set meal starts from $599+ for 10 people and some highlights include Ginseng Fortune Chicken, Golden Cereal Prawn, and Steam Lotus Leaves Rice with Chinese Sausage and Shredded Scallop. 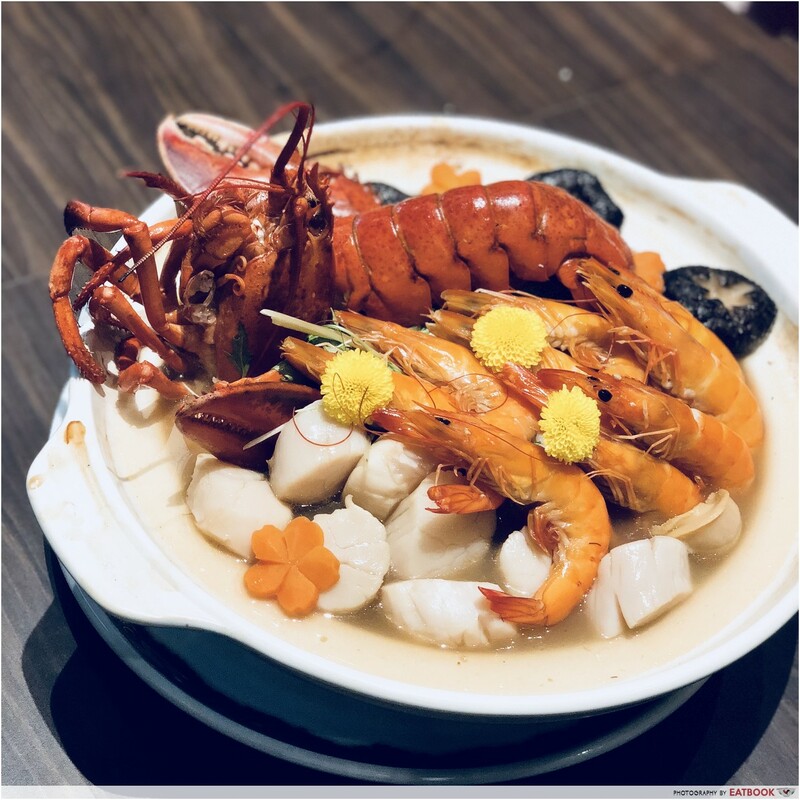 They have an extensive a la carte menu as well, serving traditional dishes such as Yam Ring Eight Treasure Vegetables with Fresh Scallop ($42.80+) and Yam Paste Gingko Nut ($30.80+). 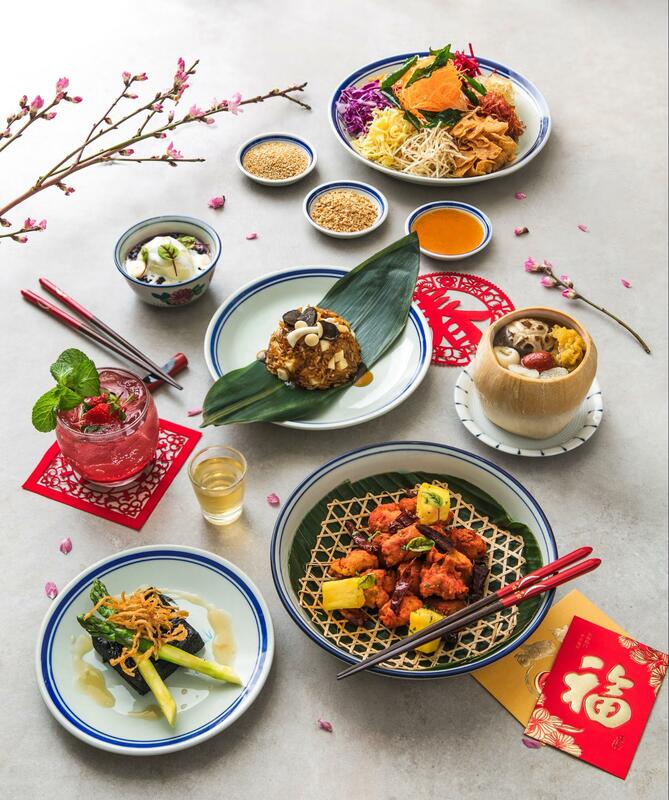 For a delicious, vegetarian CNY reunion feast, Elemen serves an eight-course menu at $108.80++ for two or $208.80++ for four people. Truffle fans will love their Prosperity Truffle Yu Sheng and Steamed Truffle Rice with Braised Sauce. The menu also features a Charcoal Beancurd with Golden Oyster Mushroom, where the tofu is pitch black – a stark contrast to the light brown ones we are used to. 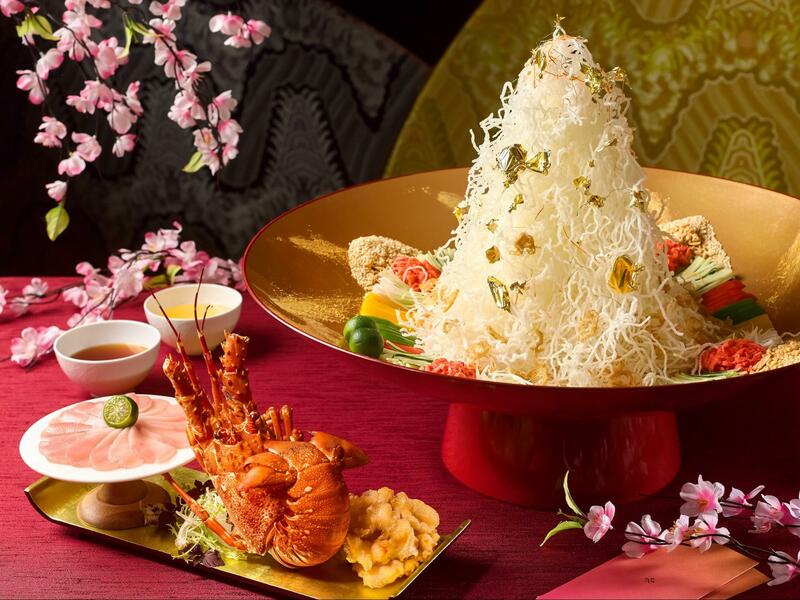 The truffle yusheng is also available on its own at $39.80++ for three to four people and $49.80++ for six to eight people. 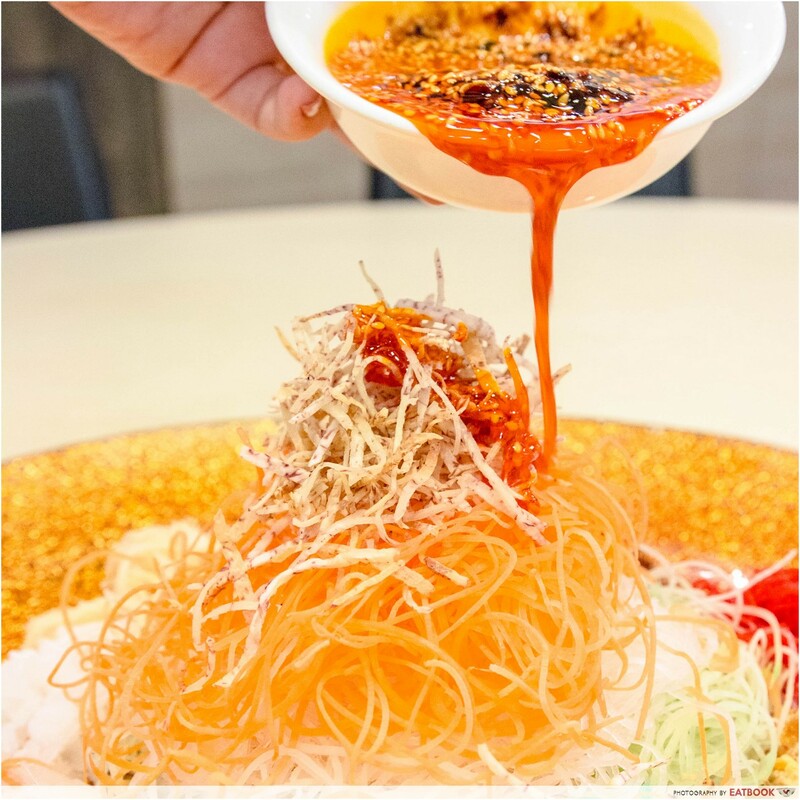 If your family is the sort that shares a giant portion of ma la xiang guo together, check out the Prosperity Lo Hei with Abalone Slice (Jelly Fish & Spicy Sauce) ($48.80++) at House of Roasted Duck. This lo hei is drenched in ma la sauce, giving the usual lo hei veggies a piquant twist. And don’t worry about it numbing your taste buds for the rest of the meal; its level of spiciness is a tad milder than xiao la (slightly spicy). The restaurant also has a series of set menus for tables of two to 10, with prices ranging from $108.90++ for two to $488++ for 10 people. There is nothing better than pigging out at a festive buffet with the family. Sky22 is offering CNY buffet from 5 Feb to 2 Mar 2018 for both lunch ($38++ per adult, $19++ per child) and dinner ($48++ per adult, $24++ per child). Both buffets feature a Lo Hei Bar so you can build your own yusheng. Mains such as Roasted Duck with Hoisin Sauce, Red Wine Braised Beef Cheeks, and Pan-seared Sea Bass with Sambal Olek already sound good enough to lure me down before the festivity starts. Nothing is worth more than spending quality time with your loved ones. For an occasion like a Chinese New Year reunion dinner, spending a bomb for a satisfying feast with the fambam is totes worth it. Let this list be an excuse for you to take your wallet out for that much-needed treat. 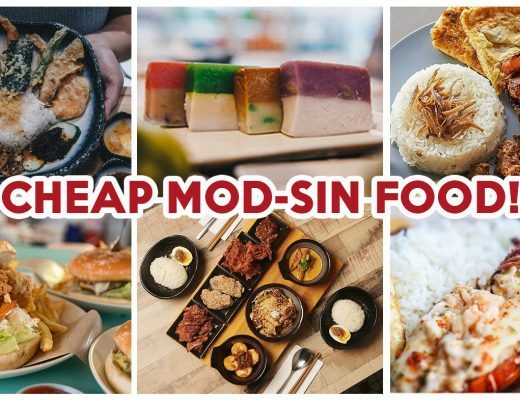 If you’re just looking for a place for you and your friends to gather together and pig out, check out these affordable mookata places, or ma la steamboats under $30!